The Ouseburn Valley is many things to many people. Whether you enjoy the Ouseburn for its bustling alternative music scene, its flourishing creative networks, or its abundant local history and heritage, the valley has something for everyone. Over the last twenty years the Ouseburn Valley has undergone a dramatic transformation from post-industrial wasteland to Newcastle’s foremost cultural and creative quarter, helped in large part by a raft of investment and community-led regeneration. Now thriving social and cultural venues exist harmoniously alongside reminders of the area’s industrial heritage, such as the Glasshouse Bridge (built in 1878), the old flax chimney outside the Cluny and the recently refurbished Ouseburn Railway viaduct. It is this interaction between past and present that gives the area its energy and charm, and makes it such an exciting place to live, work or play. 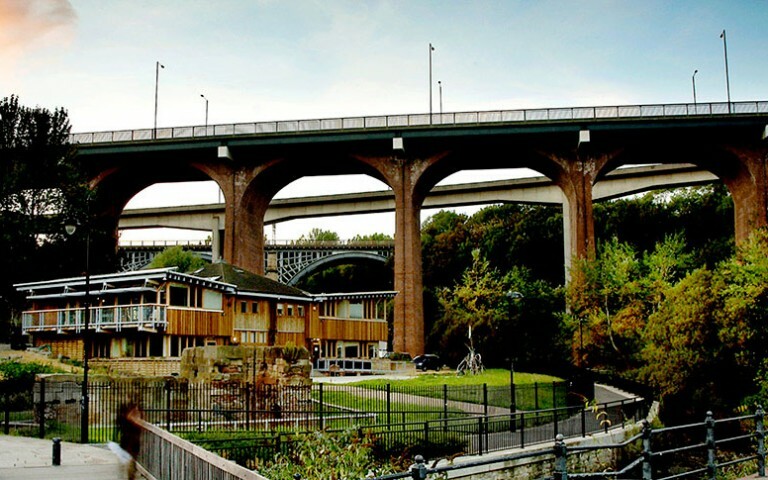 For more information about the Ouseburn Valley and its history please visit the Ouseburn Trust website, or for information on community-related issues, please visit the Ouseburn Futures website. If you're interested in local heritage, the Ouseburn Trust would be worth looking into. For more community-focused volunteering, Ouseburn Futures or Ouseburn Community Centre might be a good place to start. If you’re interested in animals or horticulture, Stepney Bank Stables and the Ouseburn Farm both take on volunteers of various ages and abilities. If you are interested in doing something more creative, why not try either Seven Stories National Centre for Children’s Books or the Star and Shadow Cinema. If you are passionate about cycling, Recyke Y’Bike regularly take on eager volunteers. If any of the above sound interesting, don’t hesitate to get in touch with the relevant organisation. For some of the organisations mentioned above, volunteers may be taken on seasonally or on a project by project basis, so volunteering opportunities may not be immediately available, but you know what they say about shy bairns! If you don’t get in touch with them, you’ll never know. This website was created and is managed by Ouseburn-based community interest company Roots and Wings and local design agency TAC. It was made possible through the support of Carillion-Igloo and URBED. If you have any comments about the site, or think there’s something missing that needs including, please don't hesitate to get in touch. The best way to get to the Ouseburn Valley is definitely by bike or on foot. It’s the perfect distance from the city centre for a very pleasant walk/cycle along Newcastle's iconic Quayside. If you’re coming from the North there are paths that run through ‘the stadium’ at the bottom of Warwick street, or from the East, cycling or walking down Shields road you take a left after Morrisons. If coming from the north of the city centre along New Bridge Street, you take a right before The Tanners pub and head down Stepney Bank. For more information on the Ouseburn Valley and its public artworks there’s a handy and informative App created by TAP North East, available for free here! The yellow Quaylink bus (Q2) runs from Haymarket bus station to the Ouseburn (Lime Street) via the Quayside, then continues on all the way to St. Peters Basin. For more information, download a Quaylink route map or timetable from here. From Newcastle Central Station (Bewick Street), bus number 22 stops just before the Tanner’s Arms. From here, cross the road and head round the corner past the Tanners, then continue on down Stepney Bank towards Lime Street. From Monument (Blackett Street), bus numbers 39, 40, 12, 62 and 63 all stop just before the Tanners Arms. From here, follow the Tanners Arms round the corner and continue on down Stepney Bank towards Lime Street. Central Station is 15 minutes away on foot. The closest Metro stations to the Ouseburn are Byker and Manors. Timetables are available here. There’s paid parking available next to Arch 6 at the bottom of Stepney Bank, or free parking on Spiller's Quay next to the Cycle Hub.